Greg Smith is the bestselling author of the thrillers, A Noble Cause, The Flamekeepers, and the Paul Chang Mystery series including Final Price, Legacy of the Dragon, and Send in the Clowns. In addition, he has released a young adult fantasy, The Crystal Mountain, and the thriller, Darwin’s Pause under his own imprint, RedAcre Press. Prior to writing fiction full time, Greg worked in public relations in Washington, D.C., Philadelphia and Wilmington, Delaware. He has an MBA from the College of William & Mary and a BA in English from Skidmore College. His debut novel, Final Price, was first released as a self-published work. The book was signed to publisher AmazonEncore, and after a fresh edit and cover came out November 2010. Since then Greg has been working with Thomas & Mercer for his Amazon Publication titles. He has just completed a yet to be published heist-thriller called Quick Fix. 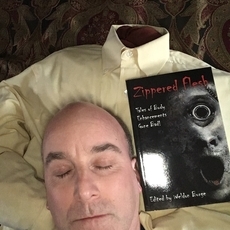 Greg's story, "Something Borrowed," was published in Zippered Flesh: Tales of Body Enhancements Gone Bad! His story, "The Pepper Tyrant," appears in Uncommon Assassins. His story, "Blenders," was included in Insidious Assassins. Greg's story, "Powder Burns," was published in A Plague of Shadows: A Written Remains Anthology.